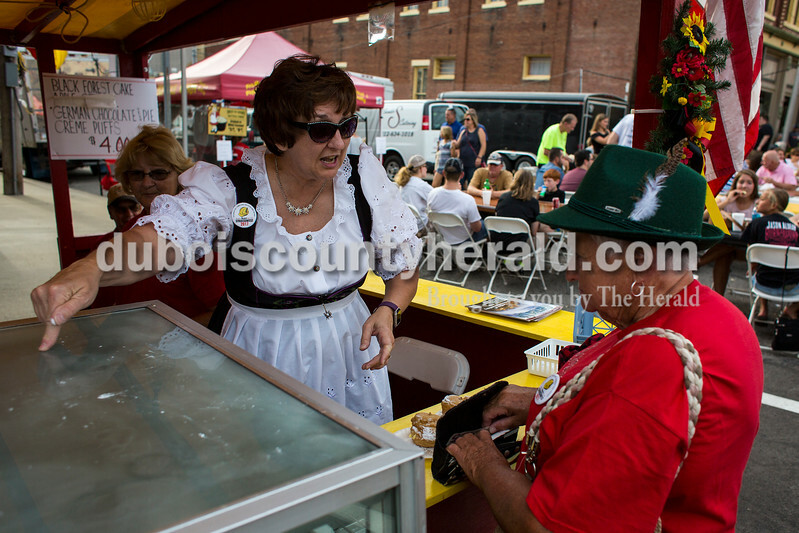 Jasper resident Laura Grammer, treasurer of the German Club, assisted Judy Knight of Owensboro, Kentucky, in the buying of two cream puffs Saturday evening at the 39th annual Jasper Strassenfest. 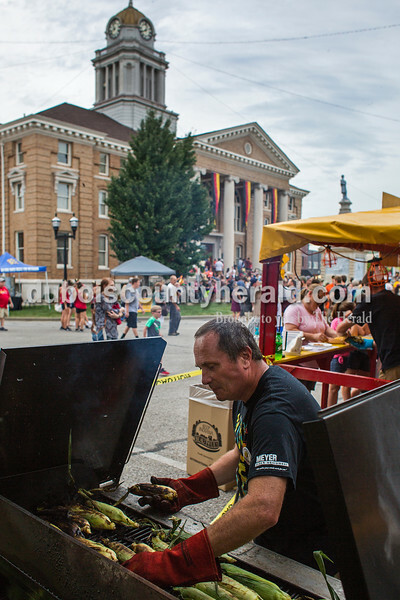 Todd Mehringer of Jasper prepared sweet corn for customers of the Young Life booth Saturday evening at the 39th annual Jasper Strassenfest. Pat and Bob Boyer of Bloomington line danced to the music of The Alpen Echos on Saturday evening at the 39th annual Jasper Strassenfest. Pat, who has been married to Bob for 64 years, said she likes attending the Strassenfest because of the music. 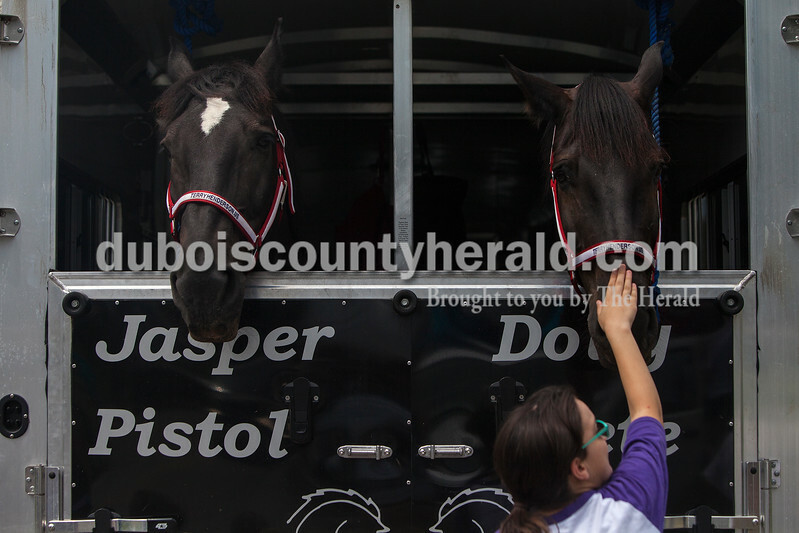 Ashlyn Ackerman of Jasper and her boyfriend Alex Hoffmann of Louisville, Kentucky, made their way across the dance floor Saturday evening at the 39th annual Jasper Strassenfest. Ackerman has been attending the Strassenfest all her life. 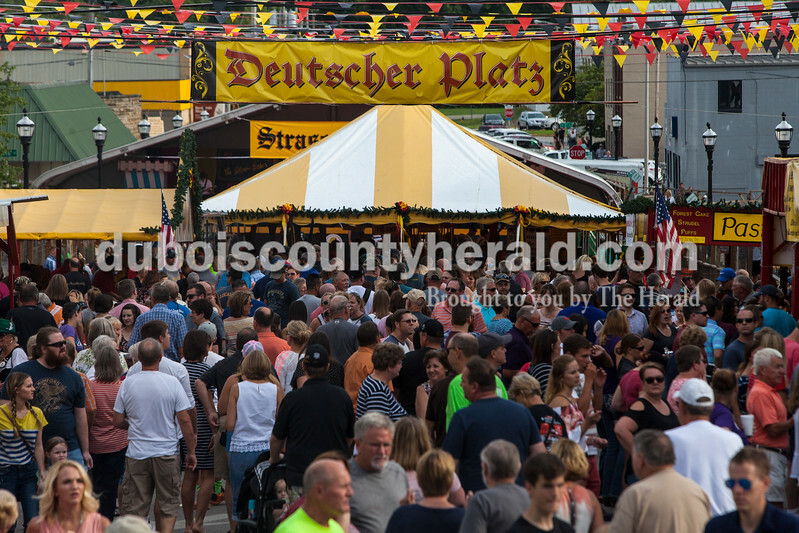 Festival goers lined Main Street on Saturday evening at the 39th annual Jasper Strassenfest. 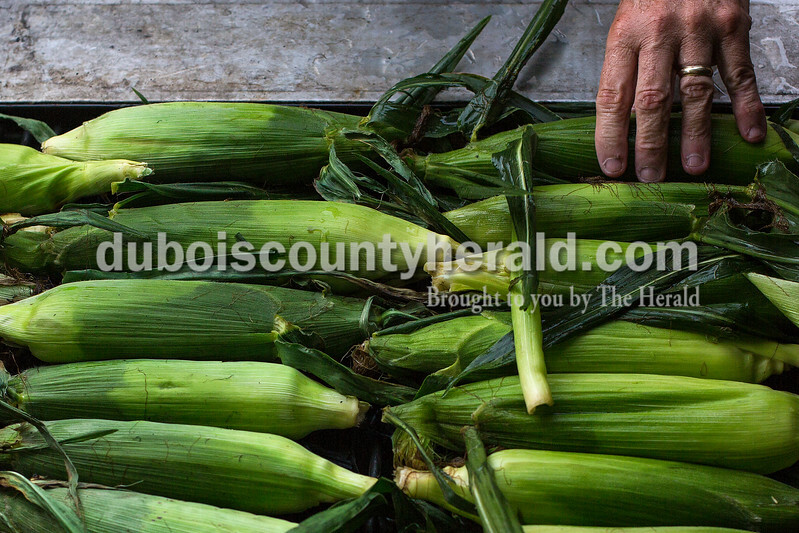 Todd Mehringer of Jasper prepared sweet corn for customers of the Young Life booth Saturday evening at the 39th annual Jasper Strassenfest. Mehringer said the booth serves as a fundraiser for the county-wide non-denominational Christian youth group. 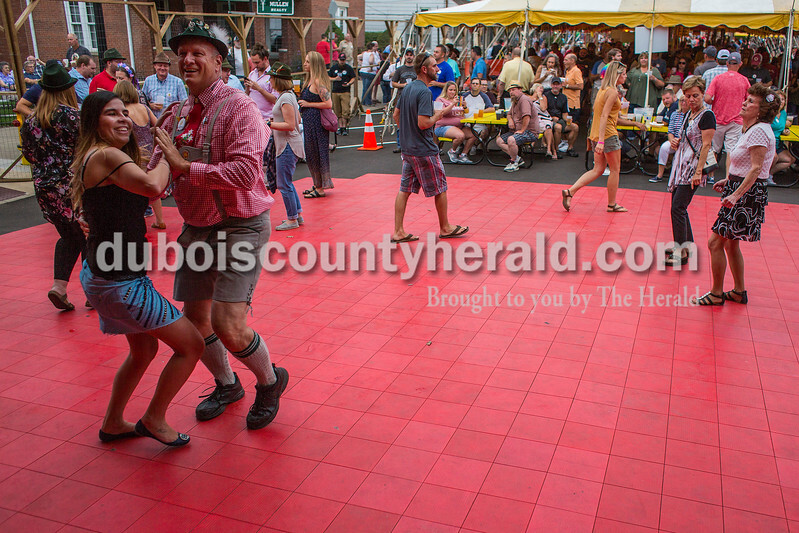 Strassenfest Chairman Mike Ackerman of Jasper and Jessica Mazzonetto of São Paulo, Brazil, took to the dance floor Saturday evening at the 39th annual Jasper Strassenfest. 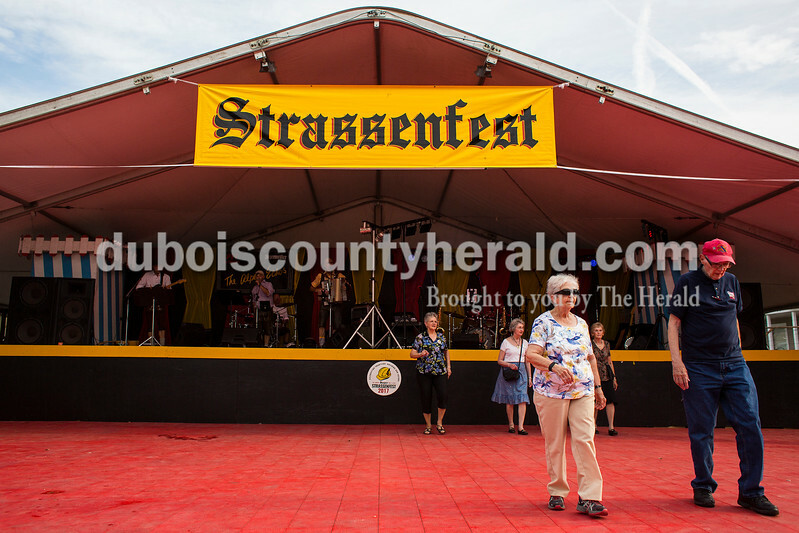 Mazzonetto said this was her first time attending the Strassenfest. 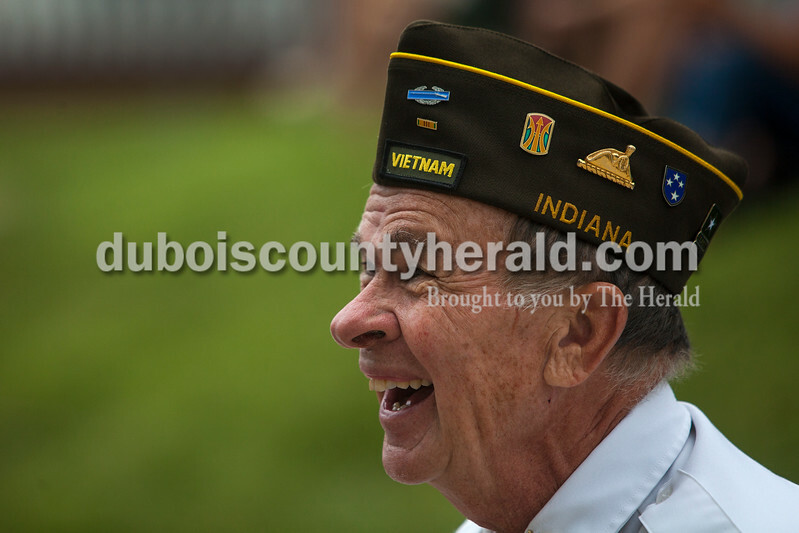 Vietnam veteran Steve Chastain of Celestine watched as the parade passed by Sunday during the 39th annual Jasper Strassenfest. Chastain, who served in the Army Infantry in Vietnam, marched as part of the honor guard with Jasper VFW Post 673 during the parade. Chastain said he has been attend the Strassenfest since it started. 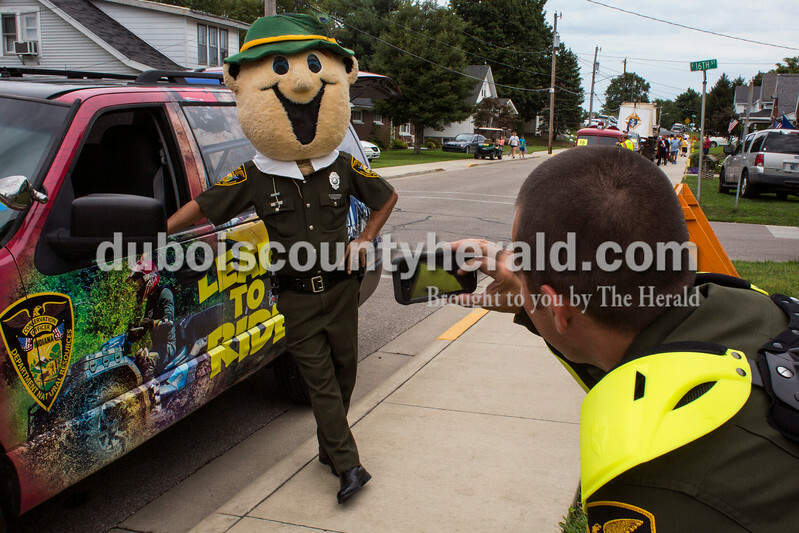 Indiana Conservation Officers Ken Tincher of Stendal, left, and Joe Haywood of Jasper tried out the Strassenfest Fritz head prior to the start of the parade Sunday during the 39th annual Jasper Strassenfest. Despite the threat of rain, hundreds of spectators lined Jackson and Main Streets to witness the parade. 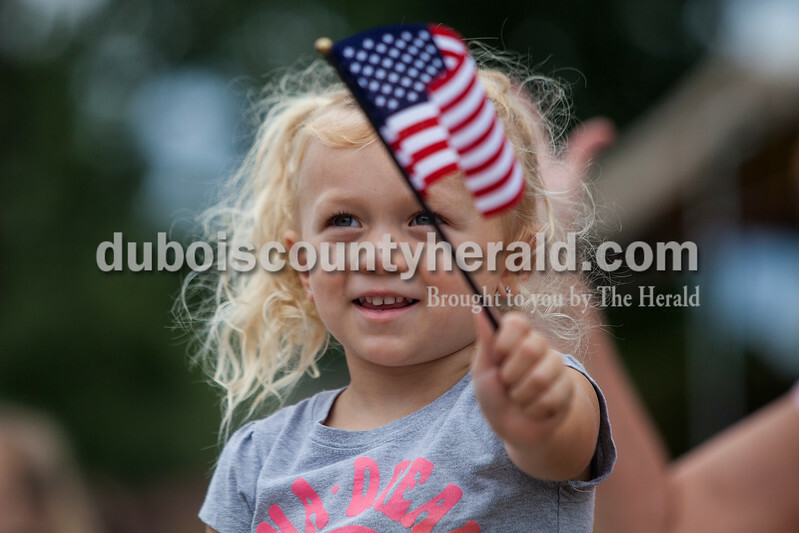 Lyla Workman of Birdseye, 3, smiled toward parade participants Sunday during the 39th annual Jasper Strassenfest. 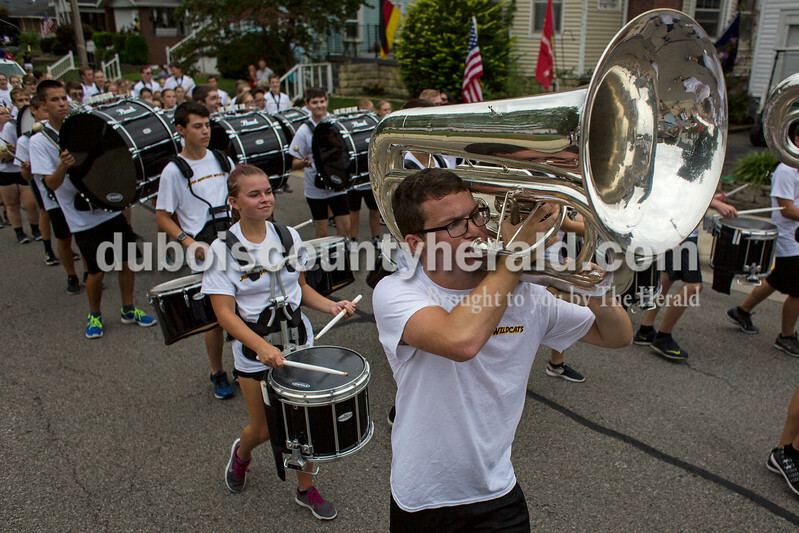 Cole Stenftenagel of Jasper, 16, played the tuba as he marched with the Jasper Marching Wildcats on Sunday during the 39th annual Jasper Strassenfest. Kurt Mehringer of Jasper carried the American flag with other members of the Knights of Columbus during the parade Sunday during the 39th annual Jasper Strassenfest. 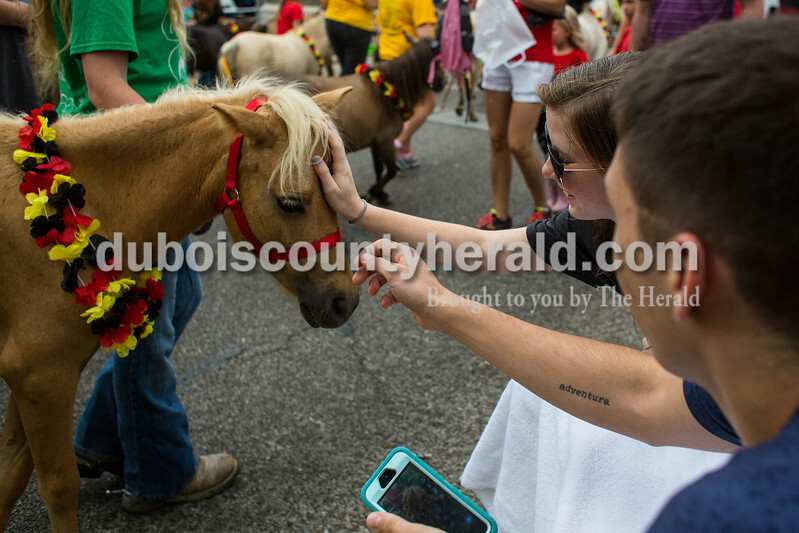 Emerald Gramelspacher-Zehr and her boyfriend Chandin Bravo, both of Jasper, petted a miniature horse along the parade route Sunday during the 39th annual Jasper Strassenfest. The pair has been dating for five months. Parade participants lined 15th Street prior to the start of the parade Sunday during the 39th annual Jasper Strassenfest. Despite the threat of rain, hundreds of spectators lined Jackson and Main Streets to witness the event. 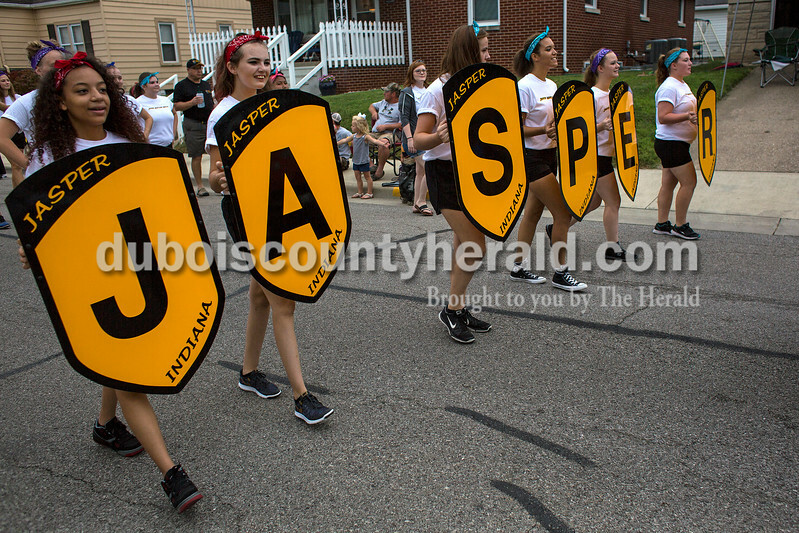 Members of the Jasper Marching Wildcats led the band up Main Street on Sunday near the end of parade route during the 39th annual Jasper Strassenfest. 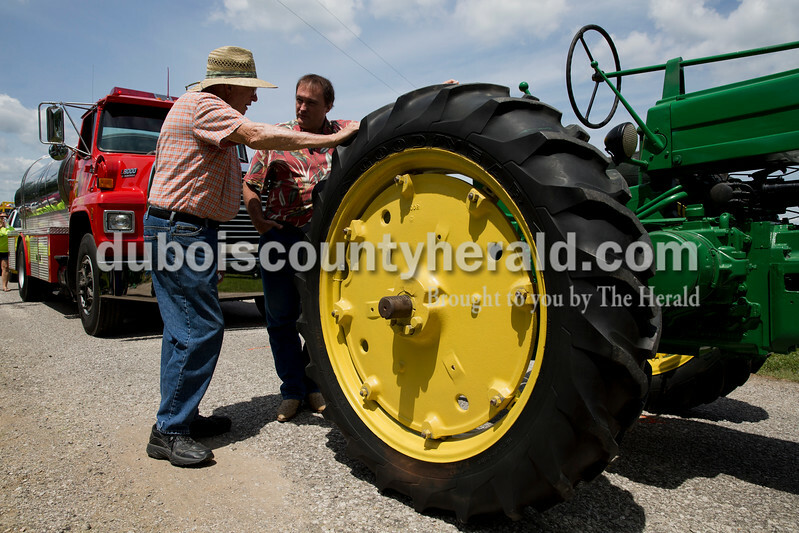 John Sickman of Stendal, left, talked with Danny Barrett of Holland as they leaned on Sickman's 1954 John Deere tractor in the stationary parade during the 45th annual Zoar Mosquito Festival at Zoar United Methodist Church on Saturday. Sickman was Barrett's fifth grade teacher at Holland Elementary. Barrett remembers seeing Charlie Sickman, John's uncle, ride by on the tractor several times a week when he was growing up. 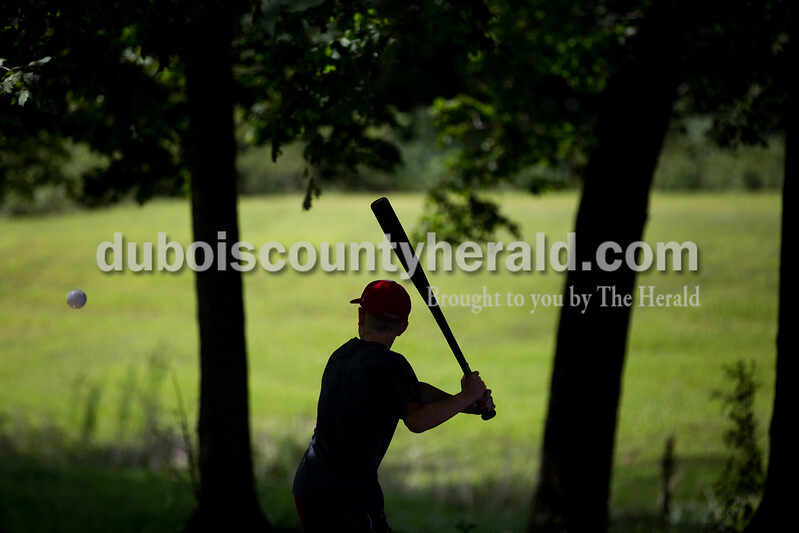 Hudson Allen of Huntingburg, 11, warmed up with his team, The Whiffle Sticks, before their next game in the Southern Indiana Whiffleball Classic at the 45th annual Zoar Mosquito Festival at Zoar United Methodist Church on Saturday. Paige Bell, left, Ilie Nicholson, both 11 and of Holland, Clair Leathers of Huntingburg, 11, and Kenley Hayes of St. Henry, 11, watched a ball soar as the Crush played the Bombers during the Southern Indiana Whiffleball Classic at the 45th annual Zoar Mosquito Festival at Zoar United Methodist Church on Saturday. Brayson Fuhs of Huntingburg, 13, right, caught a raw egg thrown by his egg toss partner Jax Nicholson of Huntingburg, 13, left, during the 45th annual Zoar Mosquito Festival at Zoar United Methodist Church on Saturday. 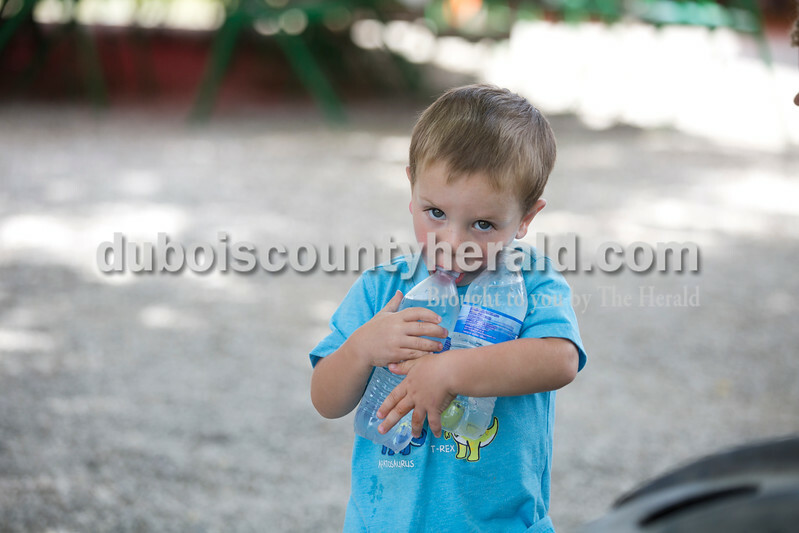 Rhys Rauscher of Duff, 2, helped carry cold water bottles to the whiffleball players during the 45th annual Zoar Mosquito Festival at Zoar United Methodist Church on Saturday. 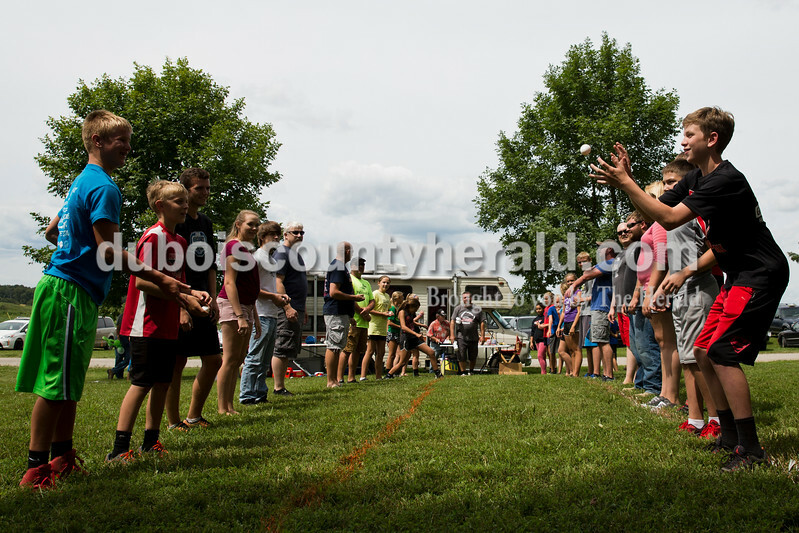 Spectators watched the Southern Indiana Whiffleball Classic, a double-elimination tournament with three age divisions, at the 45th annual Zoar Mosquito Festival at Zoar United Methodist Church on Saturday. 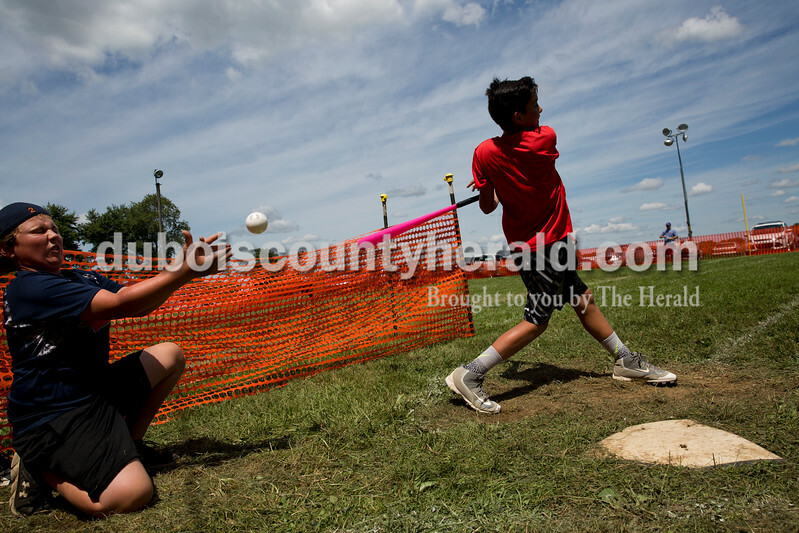 Mason Stapleton of Duff, 12, played catcher as Dedrick Hoing of Huntingburg, 12, batted during the Southern Indiana Whiffleball Classic at the 45th annual Zoar Mosquito Festival at Zoar United Methodist Church on Saturday. 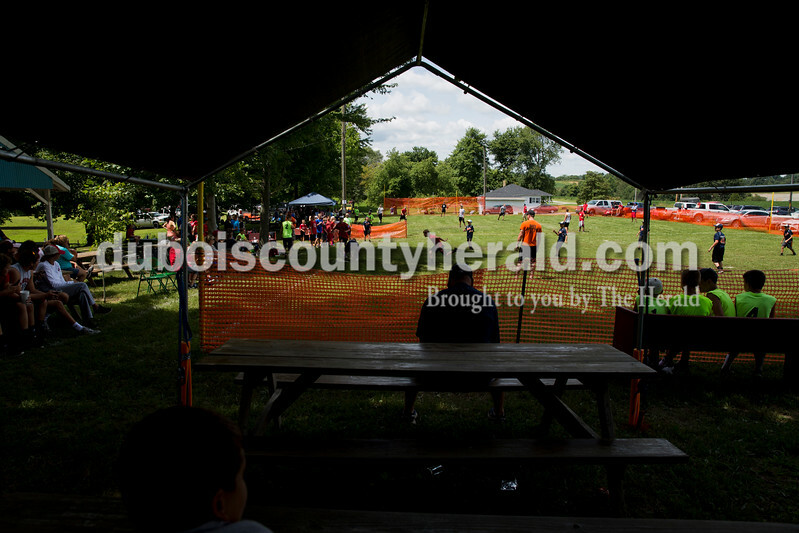 Spectators watched as the Crush played the Bombers during the Southern Indiana Whiffleball Classic, a double-elimination tournament with three age divisions, at the 45th annual Zoar Mosquito Festival at Zoar United Methodist Church on Saturday. 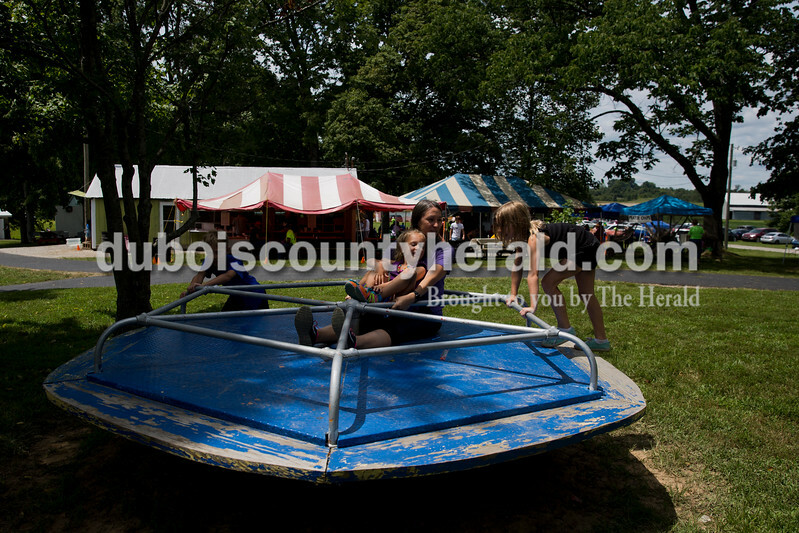 Ashley Kirk of Holland sat with her daughter Amelia, 5, as her nephew Jaxson Flamion, 9, left, and niece Lilly Flamion, 7, both of Holland, spun the roundabout during the 45th annual Zoar Mosquito Festival at Zoar United Methodist Church on Saturday. 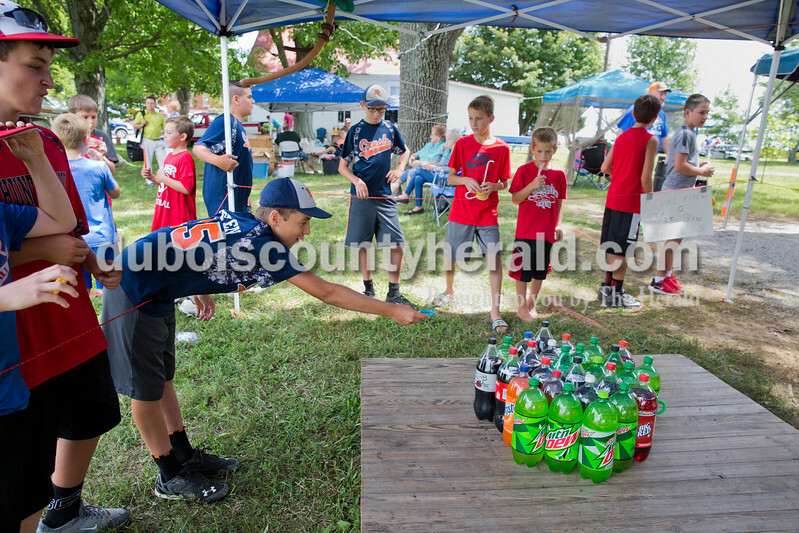 Kyan Thyen of Duff, 12, leaned over the rope to attempt the ring toss game during the 45th annual Zoar Mosquito Festival at Zoar United Methodist Church on Saturday. 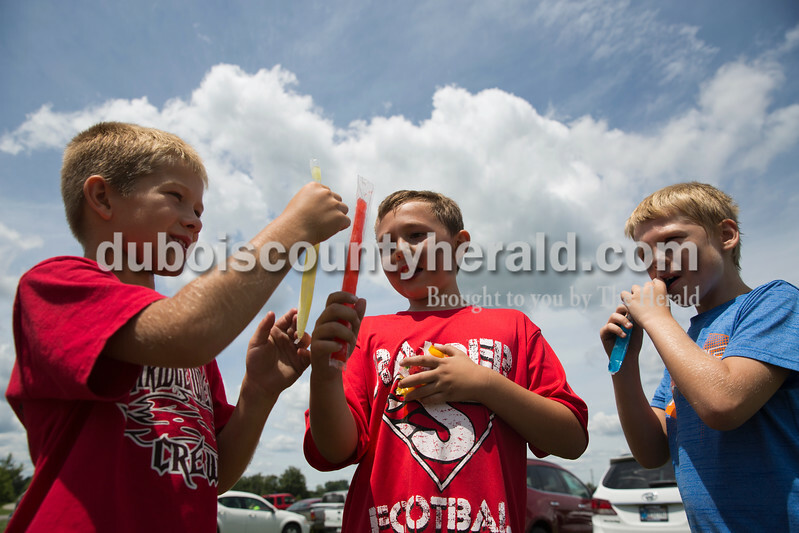 Clint Wirthwein, 8, left, Tucker Ferguson, 9, and Levi Wilkey, 8, all of Huntingburg, compared popsicle sizes during the 45th annual Zoar Mosquito Festival at Zoar United Methodist Church on Saturday. 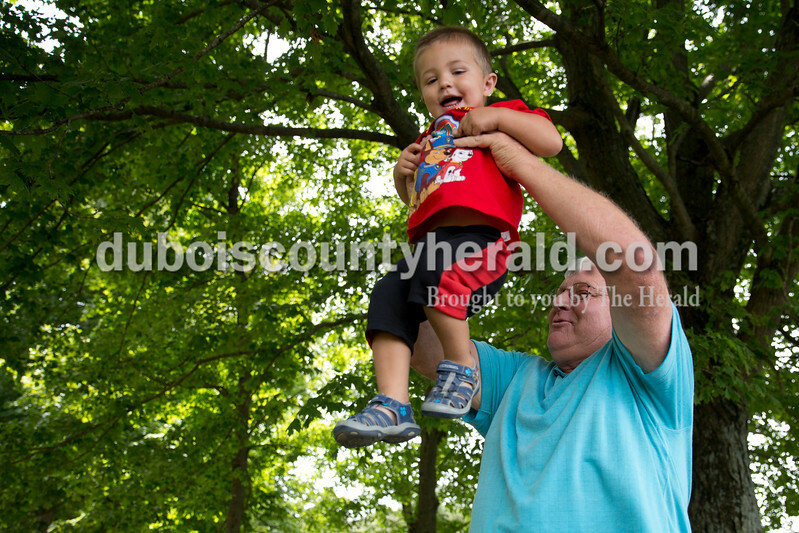 David Bayer of Huntingburg lifted his grandson Brantley Bayer of Huntingburg, 1, repeatedly as Brantley jumped during the 45th annual Zoar Mosquito Festival at Zoar United Methodist Church on Saturday. 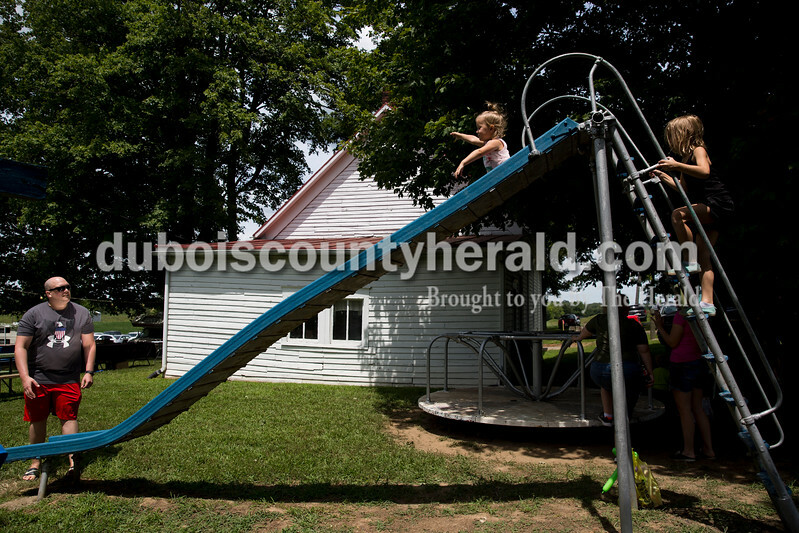 Levi Kirk of Holland waited at the end of the slide to catch his 2-year-old daughter Jovi as her cousin Lilly Flamion of Holland, 7, climbed up the ladder during the 45th annual Zoar Mosquito Festival at Zoar United Methodist Church on Saturday. 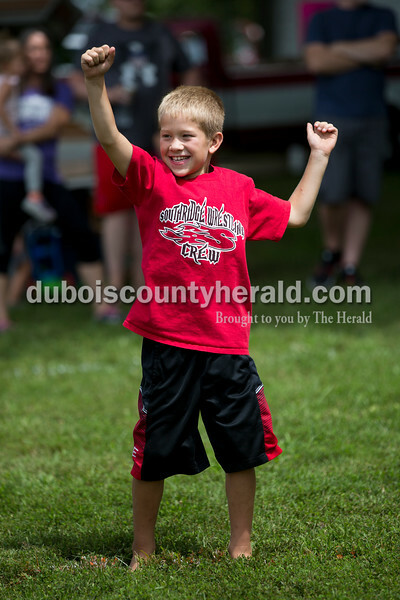 Clint Wirthwein of Huntingburg, 8, celebrated when his egg did not break after he threw it to his partner in the egg toss competition during the 45th annual Zoar Mosquito Festival at Zoar United Methodist Church on Saturday. Janie Meyer of Holland laughed as her 4-week-old granddaughter Charlie Merter yawned during the 45th annual Zoar Mosquito Festival at Zoar United Methodist Church on Saturday. 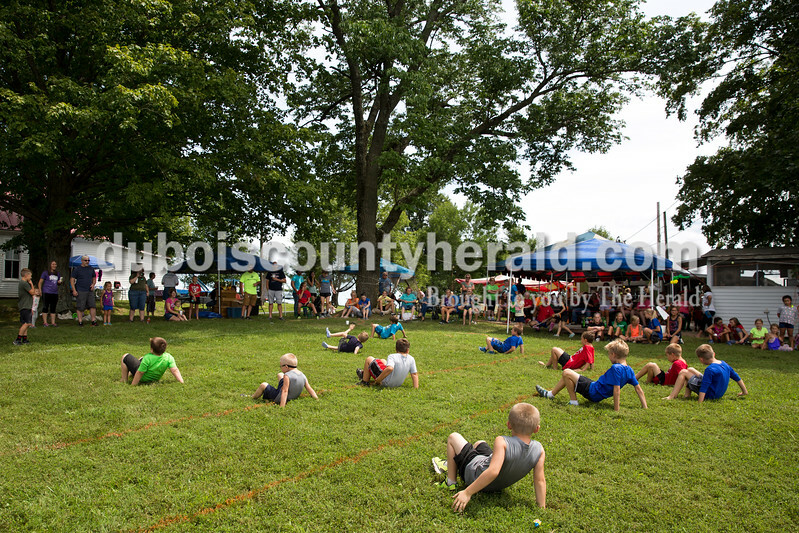 Boys competed in the crab walk race during the 45th annual Zoar Mosquito Festival at Zoar United Methodist Church on Saturday. 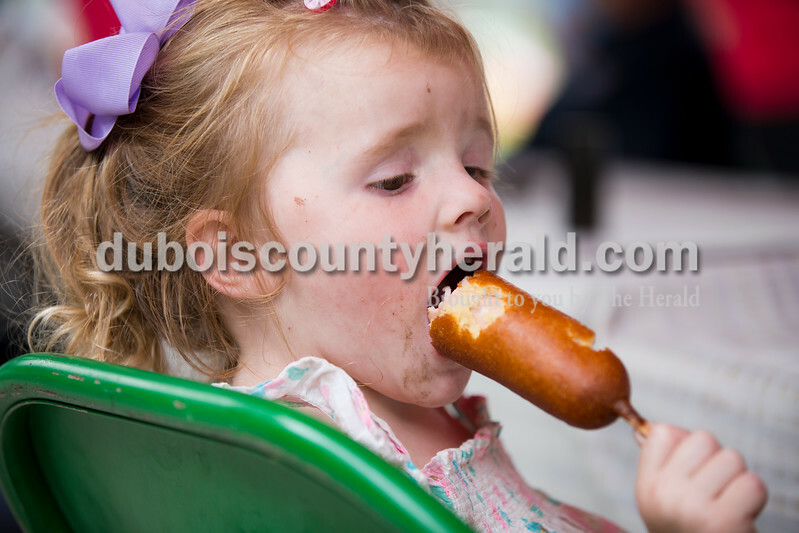 Sarah Reller of Stendal, 3, ate a corn dog during the 45th annual Zoar Mosquito Festival at Zoar United Methodist Church on Saturday. 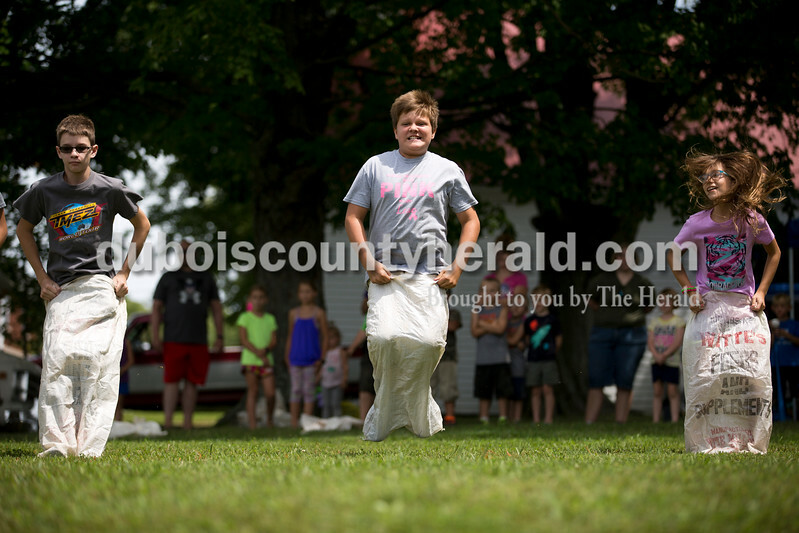 Dallas Reutepohler of Holland, 12, left, Corey Goepper of Velpen, 12, and Ava Helming of Dubois, 10, competed in the sack race during the 45th annual Zoar Mosquito Festival at Zoar United Methodist Church on Saturday. 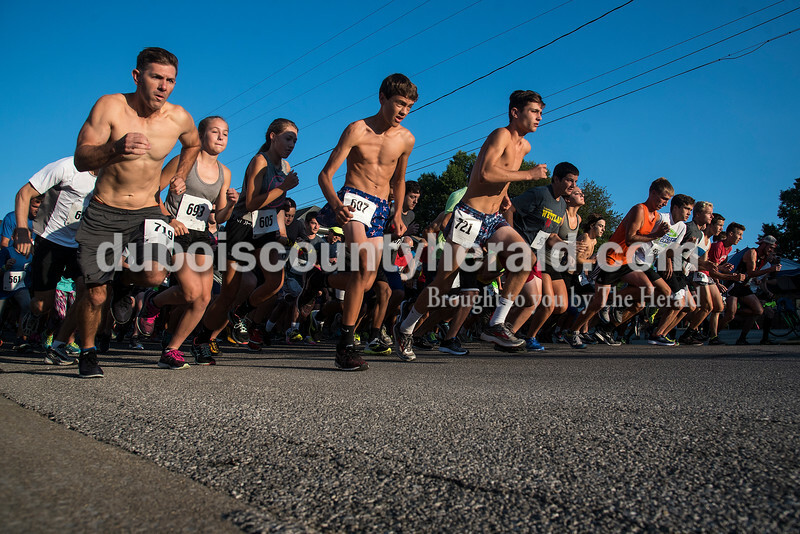 Runners took off from the start line Saturday morning in the Wettlauf 5K Road Run and Fitness Walk at the 39th annual Jasper Strassenfest. 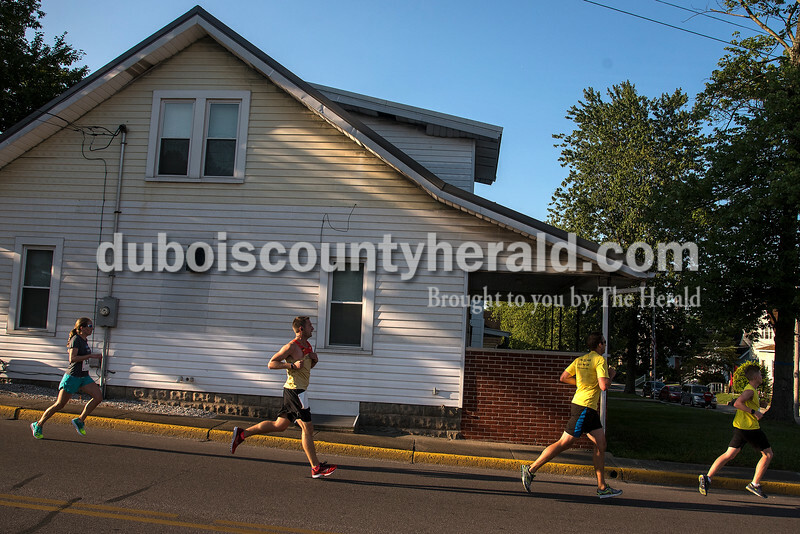 Runners prepared to round a corner Saturday morning in the Wettlauf 5K Road Run and Fitness Walk at the 39th annual Jasper Strassenfest. 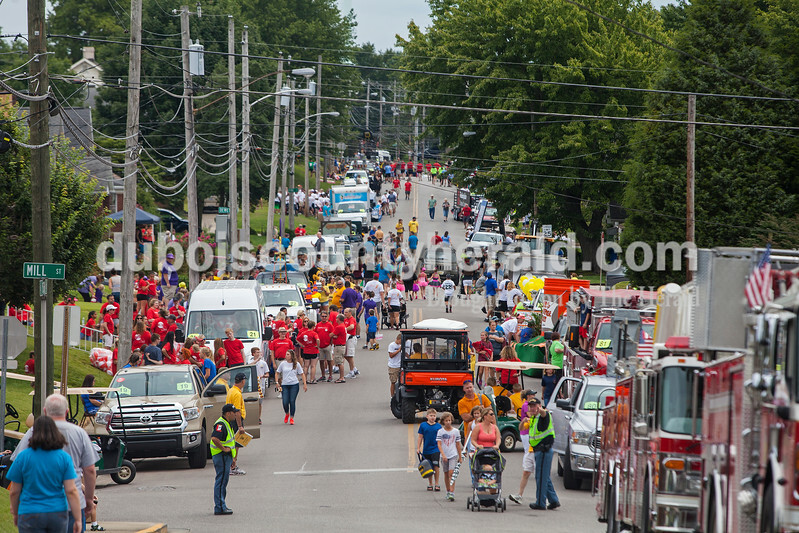 Andi VanMeter of Jasper, Jill Kaiser of Tell City, both 13, and Kristi Schumacher of Hanover took a seat following their completion of the Wettlauf 5K Road Run and Fitness Walk on Saturday morning at the 39th annual Jasper Strassenfest. 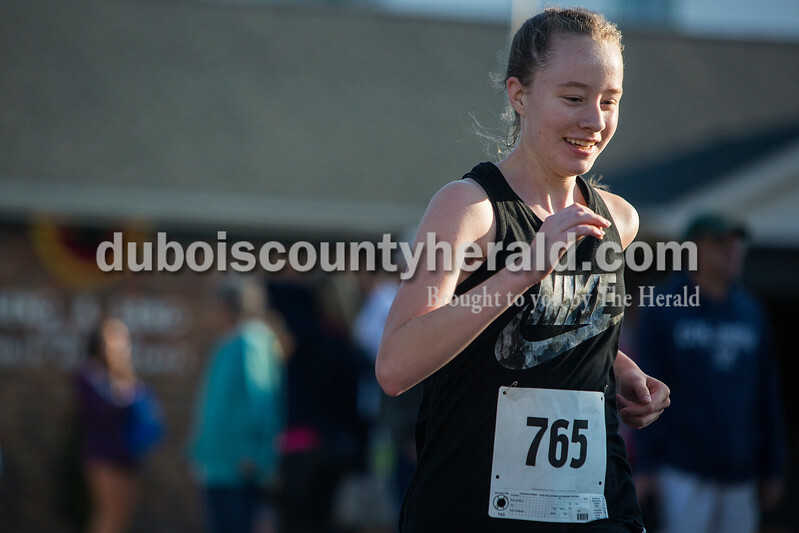 Melissa Bielawa of Jasper, 15, neared the finish of the Wettlauf 5K Road Run and Fitness Walk on Saturday morning at the 39th annual Jasper Strassenfest. For the first time the M.I.B., Mom's in Black, hosted a information session for mothers of football players of any age Friday evening in Huntingburg. Wives of the Southridge High School coaching staff: Stephanie Buening, Tracey Michel, Amy Maxey, Jennifer Murphy and Beth Winkler set-up the group to provide support and information about youth and high school football. Seniors on the team explained safety, positions and rules of the game to mothers through a variety of stations. 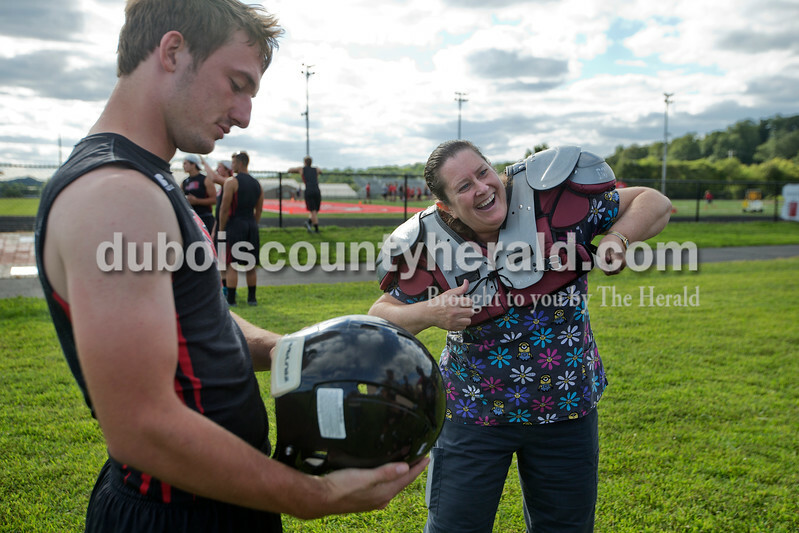 Deb Brunsman of Huntingburg tried on the shoulder pads while senior Justin Lammers had a helmet ready for her to try on as well. For the first time the M.I.B., Mom's in Black, hosted a information session for mothers of football players of any age Friday evening in Huntingburg. Wives of the Southridge High School coaching staff: Stephanie Buening, Tracey Michel, Amy Maxey, Jennifer Murphy and Beth Winkler set-up the group to provide support and information about youth and high school football. Seniors on the team demonstrated different offensive plays to mothers gathered and answered questions about the game. For the first time the M.I.B., Mom's in Black, hosted a information session for mothers of football players of any age Friday evening in Huntingburg. Wives of the Southridge High School coaching staff: Stephanie Buening, Tracey Michel, Amy Maxey, Jennifer Murphy and Beth Winkler set-up the group to provide support and information about youth and high school football. 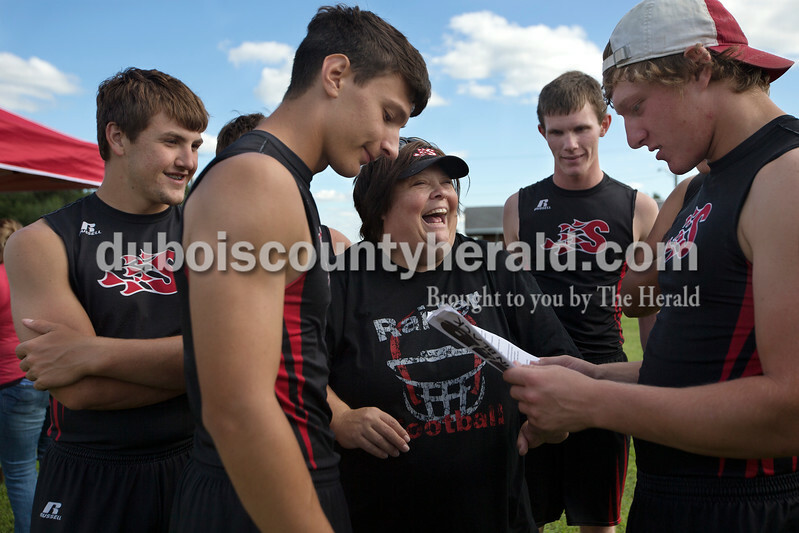 Tracey Michel joked around with Southridge seniors Colton O'Brien, from left, Colin Smith, Jacob Masterson and Kortland Hartke about the informational brochure before starting the M.I.B. session. For the first time the M.I.B., Mom's in Black, hosted a information session for mothers of football players of any age Friday evening in Huntingburg. Wives of the Southridge High School coaching staff: Stephanie Buening, Tracey Michel, Amy Maxey, Jennifer Murphy and Beth Winkler set-up the group to provide support and information about youth and high school football. 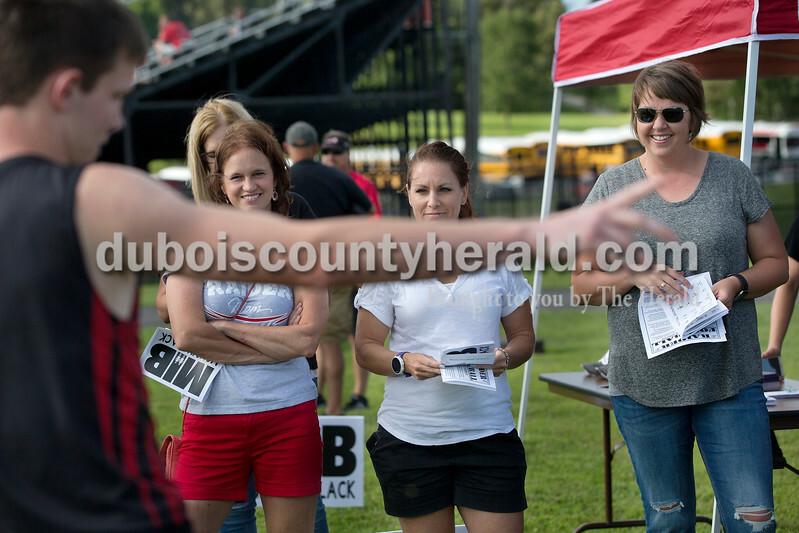 Shannon Fuhs of Huntingburg, left, Sherri Hasenour of Holland and Erin Meyer of Holland listened to Southridge senior Jacob Masterson explaining different football positions. "It was a lot of fun," Meyer said of the session. "I learned a lot from the guys." Save The Koerner Block Committee volunteers Roy Partenheimer, left, and Mary Ann Cummings, both of Birdseye, and Greg Sekula of New Albany, Indiana Landmark's southern regional director, piled things to be disposed of into a front loader as they worked to clean up the Koerner Commercial Block building in Birdseye on Monday. Partenheimer remembers shoveling coal into the stove in the store when he was a boy. Indiana Landmarks hopes to find a buyer that is willing to rehabilitate the building or that the Save The Koerner Block Committee is able to form a nonprofit to support the efforts. 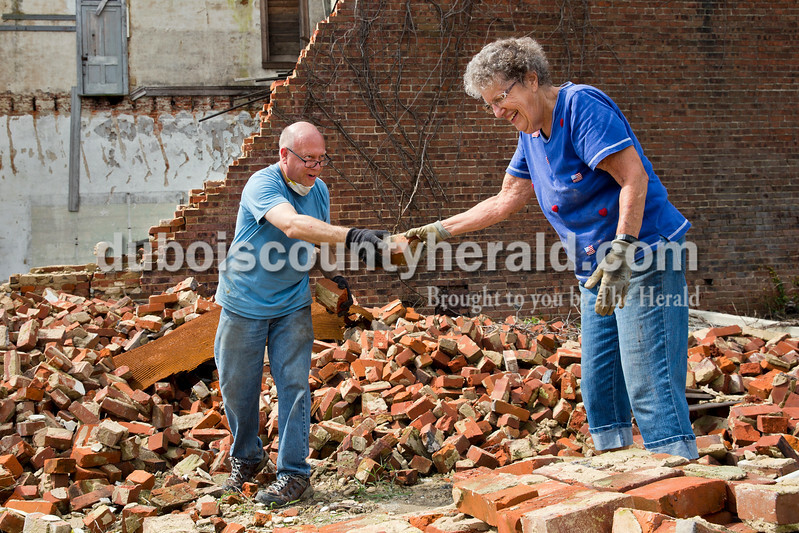 Judy Wilson of Birdseye cleaned up debris as Laura Renwick of New Albany, community preservation specialist at Indiana Landmarks, stacked bricks at the Koerner Commercial Block building in Birdseye on Monday. 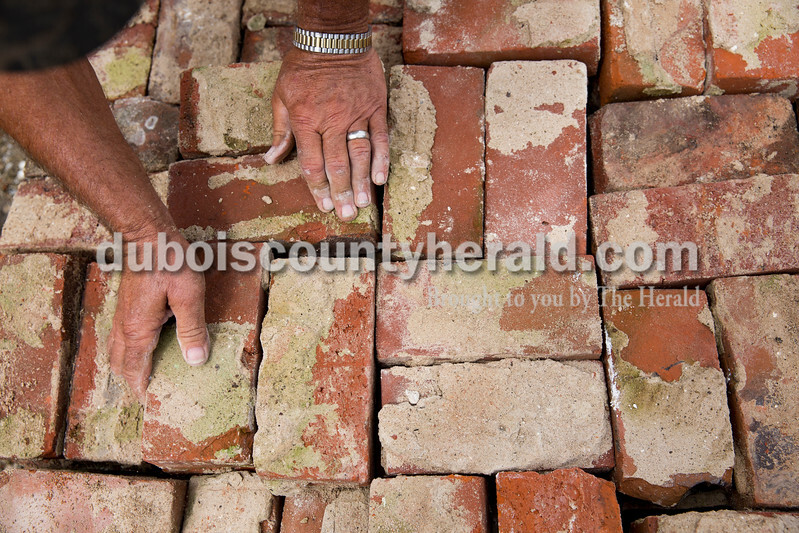 The intact bricks will be used to rebuild the wall and the partial brick pieces will be used to fill in the cistern. 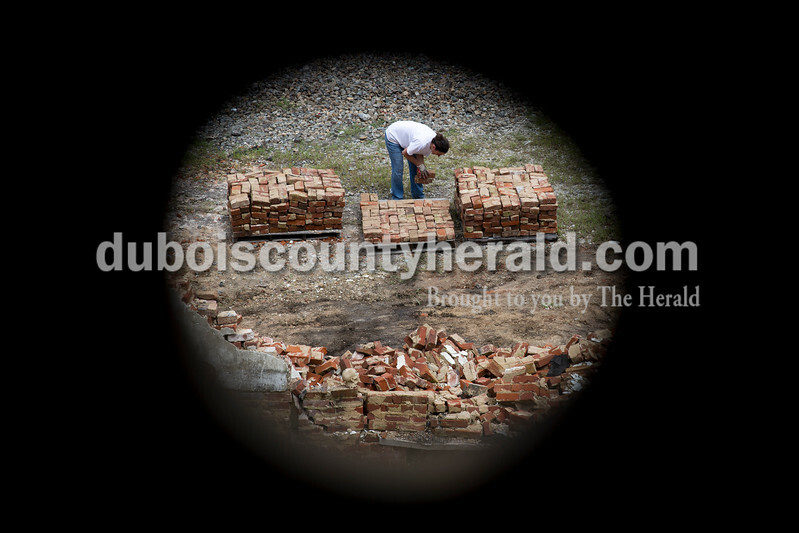 Roy Partenheimer of Birdseye stacked bricks at the Koerner Commercial Block building in Birdseye on Monday. The intact bricks will be used to rebuild the wall and the partial brick pieces will be used to fill in the cistern. Greg Sekula of New Albany, Indiana Landmark's southern regional director, handed bricks to Judy Wilson of Birdseye at the Koerner Commercial Block building in Birdseye on Monday. Wilson recalls when the back wall collapsed in 2013. "You could hear it all over town, I didn't know what it was," Wilson said. "It was a surprise but it really woke everyone up to the fact that we needed to do something." 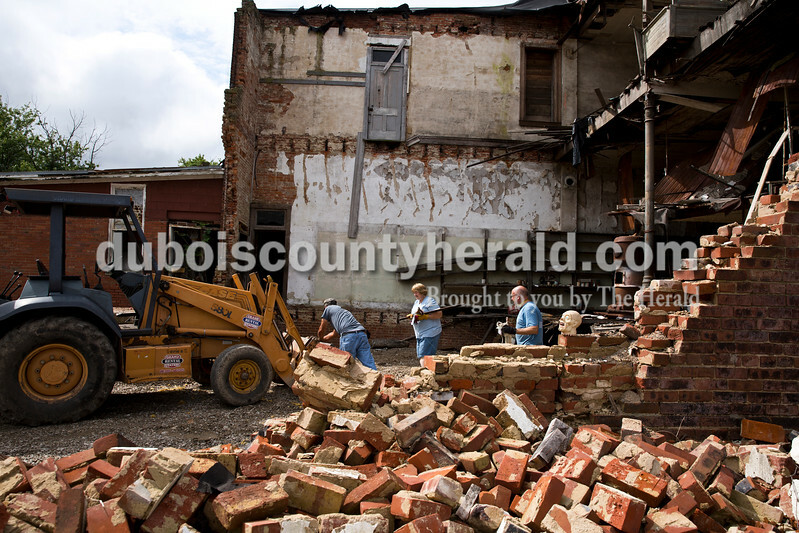 More of the brick wall was taken down in the process of stabilizing the building. The intact bricks will be used to rebuild the wall and the partial brick pieces will be used to fill in the cistern. 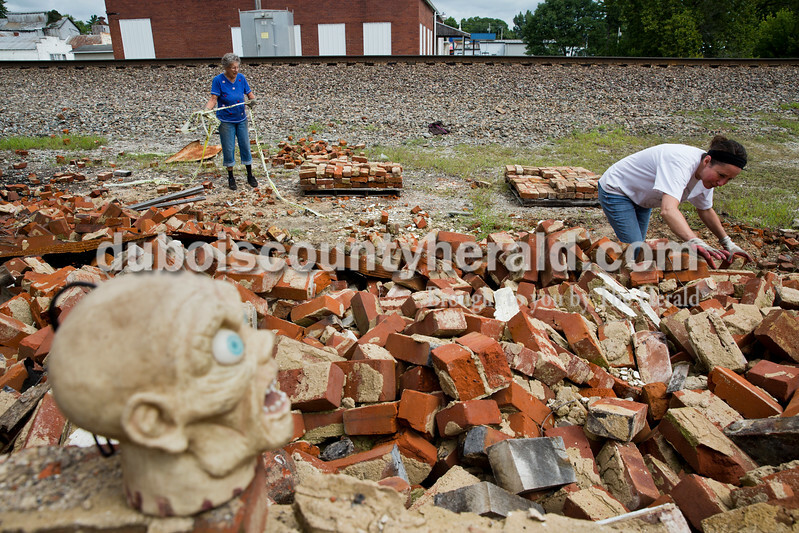 Laura Renwick of New Albany, community preservation specialist at Indiana Landmarks, stacked bricks at the Koerner Commercial Block building in Birdseye on Monday. The intact bricks will be used to rebuild the wall and the partial brick pieces will be used to fill in the cistern.